Life on Siargao was pretty special. It's a tiny island 800km southeast of the capital, Manila. After doing a bit of research me and my friend decided to spend 3 whole weeks on the island. We had heard that everyone who goes here, either extends there stay or we heard some don't ever end up leaving!! After a short flight from Manilla we flew over the most amazing views. I have never seen so much green in one place! I would say most of the tourists on the island were there for the surf. Soon after we landed we made our way down to 'Jacking Horse' a popular beach and beginners surf spot.. We only intended to watch on the beach but the temptation to jump in was too strong. Theres an amazing group of filipino surfer boys on the beach offering 1-1 surf lessons & board hire. We went for a 2 hour lesson which cost us around £15 each! We booked a homestay in Luna for most of our stay in Siarago at an amazing place called 'FootPrints'. I would recommend staying here to anyone, the location was amazing, it was mega cheap & best of all Apple & David who own the homestay were the friendliest people. We were instantly welcomed like family and Mari the manager became one of our best friends on the island. The homestay is separated into 4 different shacks and whilst most of the accommodation is shared, there were private accommodation with air con available too. 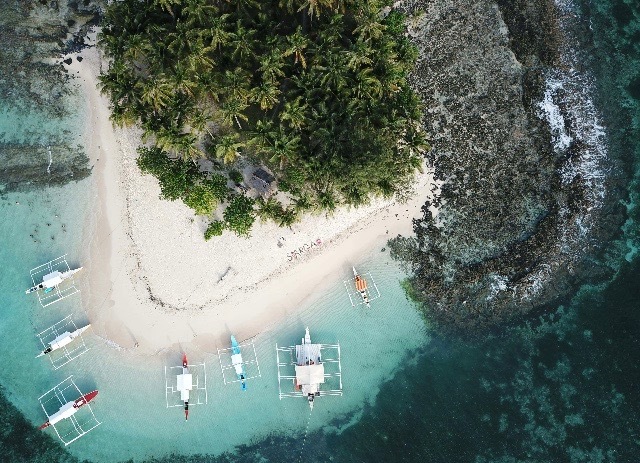 The main areas on Siargao island for restaurants and nightlife were called 'General Luna' and 'Cloud 9'. There were probably only 10 main restaurants and bars that people actually went to and we were told the businesses were in agreement with each other to host their own event night on one night of the week each. Wednesday and Friday Reggae nights at Rum Bar, Live Music & Arts night on a Tuesday at Vientos and 'After Surf Sunday' at Bravo. The food was incredible absolutely everywhere, you could eat as cheap or as expensive as you like. Our favourite places were The Taco stand at Fat Lips, Mamas Grill BBQ and Kermits Italian for their famous pizzas! An amazing spot for a healthy breakfast was at Shaka's in Cloud 9, offering smoothie bowls & fresh juices. 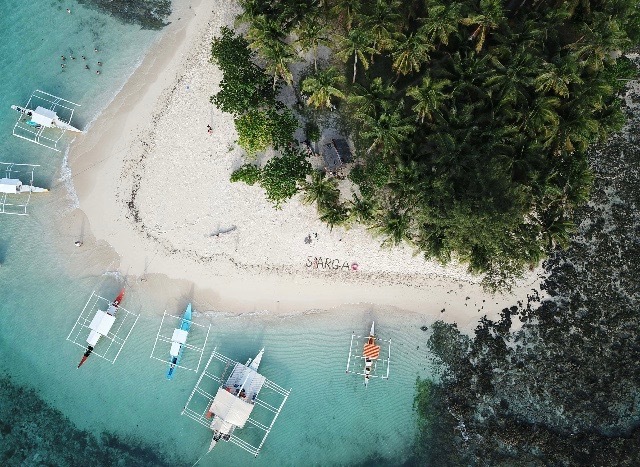 Sugba is a salt water lagoon south of Siargao island where up to 3000 salt water crocs call home, tons of jellyfish and the most perfect, stunning turquoise waters. We did a trip here through a group called "My Siargao Guide". They are found at Bravo Resort where you can sign up to loads of different trips and dates. An amazing way to meet new people and explore the island. The 3 Island Tour was probably the most popular on the island.. Naked, Guyam & Daku. You could sign up with different filipino tour companies or even get your own boat across with one of the local filipinos. If there were a group of you they would take you to the local market in the morning to buy your food for the day and then cook it all for you on one of the islands . This not so secret spot was a perfectly unspoilt beach hidden off one of the main roads. The waves were beginner - intermediate and wasn't overly popular like Jacking Horse so it was a really good spot to learn and practise. Ahhh that simple life!